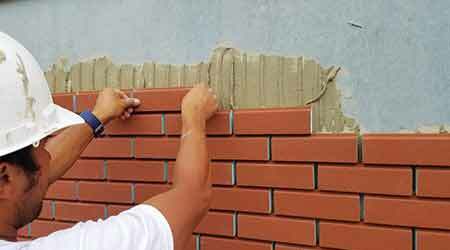 NewBrick is a lightweight insulated brick product that retains clay brick’s classic size and appearance. It weighs 1⁄12 the weight of full clay brick. Horizontal alignment guide eliminates the need for support pans, and since NewBrick is adhesively attached, brick ties are not necessary. Installs faster than clay face brick or thin brick. Can be installed direct to nearly any substrate or a Dryvit Outsulation system basecoat. Engineered drainage plane removes incidental moisture. Meets NFPA 285 multi-story fire test. Less expensive freight to the job and easy to stage on the job. Product provides thermal insulation built right into the brick and requires less energy to manufacture and to transport. Can be installed by masons or traditional EIFS installers. Easier and safer to work with than clay brick, especially on multi-story construction.